Proper diet and nutritional supplementation is vitally important. If you aren’t supplying your body with the proper amount of protein and essential minerals and vitamins your body will take whatever nutrition it is getting from non-life support systems such as your hair and nails and direct what little it is getting to your vital organs, thereby robbing your hair and nails of the essential components it needs to stay healthy. Everyone speaks of taking Biotin supplements but what most people don’t realize is that if the supplements you are taking do not have the correct balance of B vitamins and other micronutrients then Biotin will not absorb properly into your system. 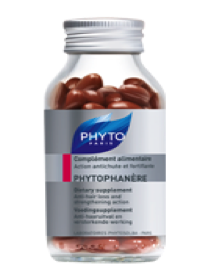 Phytologie has solved this issue by creating PHYTOPHANERE, a dietary supplement comprised of all natural ingredients. Packed with nourishing vitamins, essential fatty acids and antioxidants this supplement will promote healthy hair growth, strengthen your nails, illuminate your skin, and fortify your lashes. Over 90% of people in a controlled study showed noticeable improvement in the state of their hair. “This is one of my daily staples since I started noticing my hair thinning. Owning a business will do that to you” jokes Frank Marino, co-owner of Salon Sora in Boca raton, Florida. “It took approximately six months but the results were dramatic”. But the best supplements in the world won’t help you if you aren’t eating a healthy, balanced diet and drinking enough water. How often you shampoo and how you shampoo can have a detrimental impact on the overall health of your hair. Shampoo is designed to gently cleanse the outer layer of your hair, but shampoo too often and you can actually dry out your hair and over stimulate oil secretion from your scalp. Some clients will tell me that they have to shampoo everyday because their hair tends to get greasy. For those clients I recommend a “dry shampoo” between washings and also remind them to only condition from the mid-lengths to the ends of their hair. It is vitally important to condition your hair after you shampoo. Conditioner is designed to “lock down” the cuticle layer of the hair. If you don’t condition your hair it will tangle and your color will fade out quicker, so ALWAYS condition. People who have color treated hair should also shampoo less frequently to keep from stripping out their color. At Salon Sora we carry two natural hair care lines, Phyto of Paris and Davines. Both lines carry a shampoo and conditioner for every hair type. Incredible shine, softness, and frizz free hair is what both of these lines impart. Whether your hair is limp and fine or coarse and curly there is a natural hair product designed to bring your hair back to its natural radiant beauty. 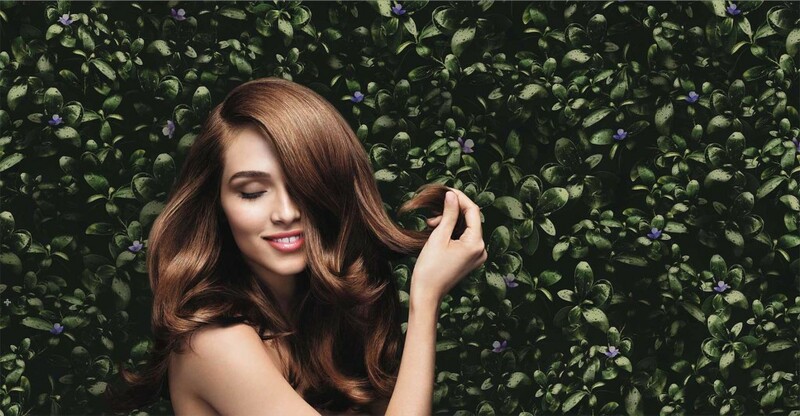 Just ask any of our hair care specialist who are there to help you make an informed decision. Ask about Oi Shampoo from Davines. If shine, silkiness, and tangle free hair is your goal then this shampoo and conditioner is for you. If frizz free hair is your goal then Phyto of Paris has a three part system that guarantees frizz free hair for 72 hours. Phytolisse shampoo and conditioner, in conjunction with Phytodefrisant will tame even the curliest of hair and keep it silky, shiny, and frizz free for days. If your hair is very dry, Davines has a beautiful water-based oil with 100% organic carthame oil. This lightweight, grease free oil will nourish your hair and help tame frizz. This is a beautiful oil to use on your skin as well. Quickly absorbed it gets right to work revitalizing your hair and skin. Davines also has an All in One Milk for softer, smoother, more supple hair. This also has a built in heat protector which also helps cut down on blow drying time. To avoid your hair becoming a tangled mess and to minimize possible breakage you should invest in a good detangler. Phytomist is one of my personal favorites. This lightweight leave-in will restore hairs moisture and radiance. Sunflower extract is added to provide a natural UV filter. A must have for the harsh Florida sun. Ok ladies, we all know that for some of you the last thing you want to do is actually cut your hair. So many people think that in order to grow their hair longer they should stop cutting it. Bad idea. Not cutting your hair on a regular basis leads to more breakage, split ends, and more frizz. It is best to cut your hair once every two months but only cut a half inch off. Hair grows a half inch a month so by cutting oit every two months this will remove some of the bad ends and allow for your hair to grow in more beautifully. Don’t shampoo too frequently, three times per week maximum should do the trick. Always condition! Start from the mid-lengths and go all the way to the ends. Use a quality shampoo and conditioner along with a good leave in. And please, cut your hair…..